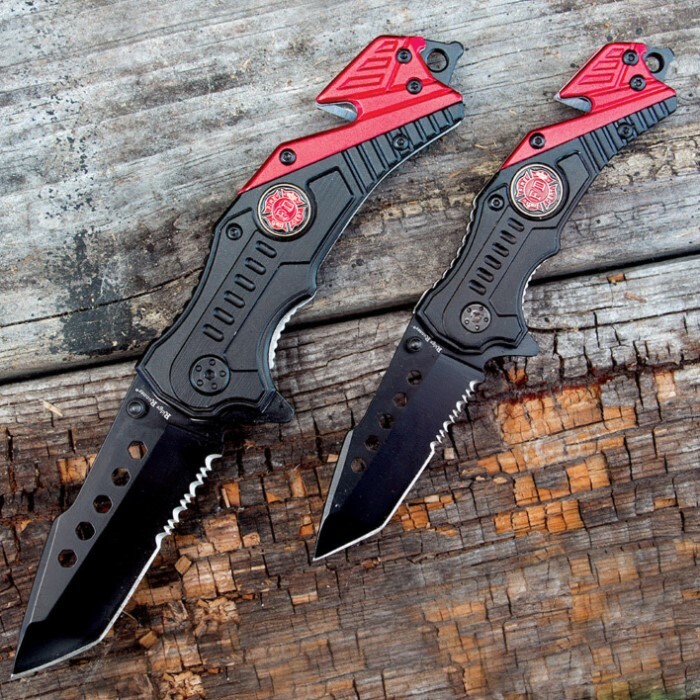 Assisted Opening Rescue Knife Set Firefighter | BUDK.com - Knives & Swords At The Lowest Prices! 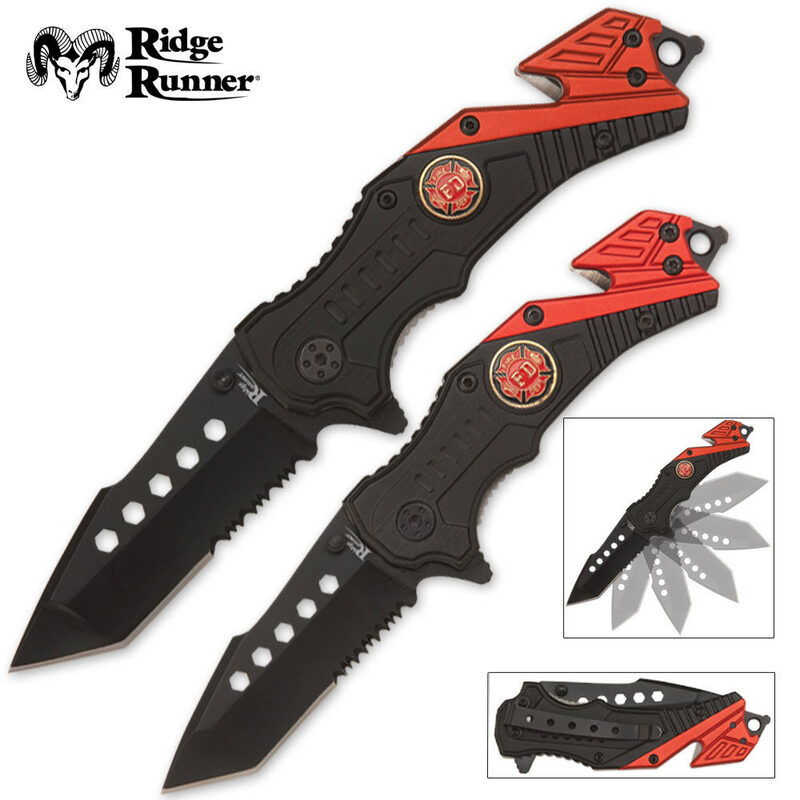 The Ridge Runner Firefighter Assisted-Open Rescue Folder Set features two assisted-open knives, a large one and a smaller one. Each anodized stainless steel blade rockets open with just a nudge of the thumb stud using the patented assisted-open mechanism. This set is the perfect gift for the hero in your family! Can't beat it for the price. Keeping one in my turnout gear and one in my truck! 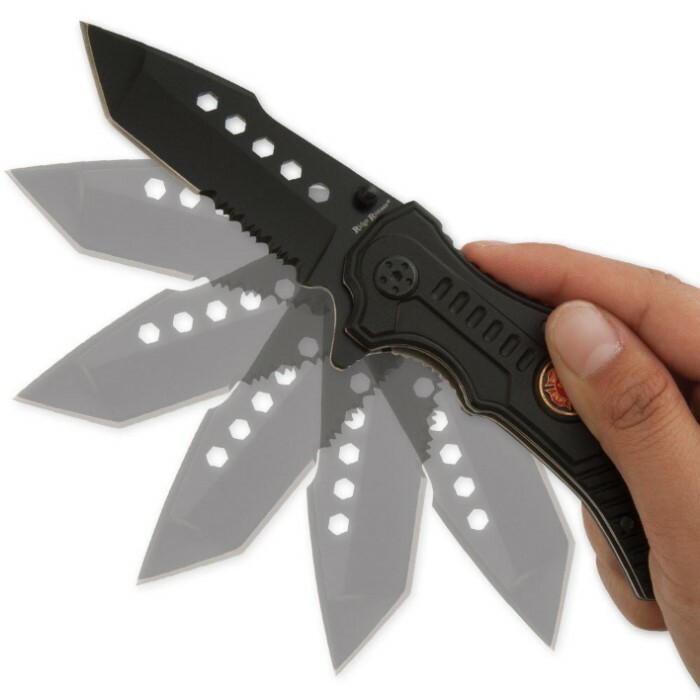 these blades are amazing the big one is great it opens easily, it fits comfortably in my hand my only complaint is that the small ones liner lock was very stiff and it was hard to open in the first place. but both were very sharp out the box. A very good deal, will make good stocking stuffers. Knives work fine. My only complaint is I order several items and the box and items smelled so bad of pesticides I had to leave them in the garage for a week and even then the smell lingered on..
beautiful knife. great deal, easy opening, solid build. Shipping was fast. Arrived 3 days before due date. Knives were sharp right out of the box. It does say that it is made in China, but still seems to be good quality. It cut paper right out of the box. I put a little gun oil on it to loosen it up a bit and it worked just fine. Great knife for the price, especially when you get a second one to go with it. If it only says, stainless steel, which it does, it usually means that it is 440A (according to one source). Out of the 440 series 440A is the lowest, 440B is the middle range and 440C is the highest quality. Good all around beat up knife in my opinion, especially for the price. You can't go wrong because even if it breaks, it's not a $200 knife that you have to replace. Very pleased. These are great tools, the seat belt cutter is extra good if you cannot reach your belt strap in an emergency situation and the glass smasher is a no brainer. I really like the tanto style blade and two for one is a great asset if you want to store one in your extra car or truck. For the price of these you can't beat the deal. Both came sharp and I have no complaints. Highly functional a decently built. The blades are sharp. The firefighter handle seem a bit silly, but they look good. the assisted open functions well. I bought a set and liked it so much my son-in-law bought one too! I keep the big one in my car for emergencies. Fast opening, sharp, and versatile, it is a great folder to keep around!